This 70-minute DVD features instruction by former University of Arizona Head Coach Jerry Stitt. 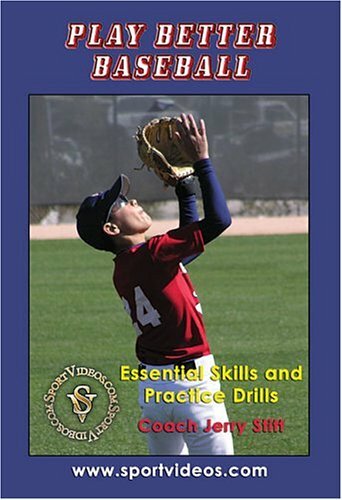 The DVD provides progressive step-by-step instruction of throwing, fielding and hitting fundamentals. Part 1 covers gripping the baseball, throwing progressions, and proper technique and footwork . It includes some movement and throwing drills which will help players to master this often neglected part of the game. It is essential to teach players how to deliver the ball to their target accurately and consistently. Part 2 covers fielding fundamentals and drills for both infielders and outfielders. The players learn glove mechanics, body positioning, footwork, how to turn the double play, communicating with teammates, and more! Practicing these fielding concepts and drills will help players to dramatically reduce the number of fielding errors. Part 3 covers essential hitting mechanics and drills. Coach Stitt provides a detailed explanation and demonstration of the elements of a good swing. Learn the four things that all great hitters have in common. You will also learn how to put the ball in play and avoid common errors. Coach Stitt provides progressive drills to work on in the batting cages. He also presents some hitting drills that can be used on the playing field to provide players with numerous repetitions and keep everyone involved. This comprehensive program will help coaches and players to establish the proper foundation necessary to be successful in baseball at any level.